The increasing amounts of data in the urban environment and the rise of data-driven design practices are generating an emerging paradigm of smart city planning. In response, this chapter addresses issues of mobility, data, and inhabitation within contemporary speculative architecture and urban informatics. Drawing on the “Future City Glasgow (http://futurecity.glasgow.gov.uk. )” project, this chapter argues that the study of temporary habitation units will be instrumental in addressing two significant real-world issues affecting future cities, namely, mobility and migration. 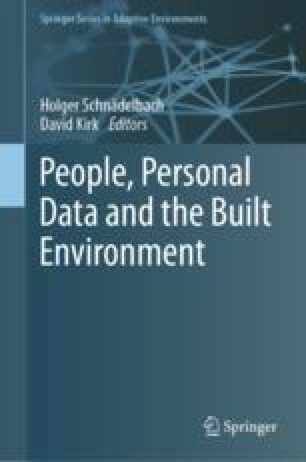 Focusing on the reuse of ‘personal data’, this research explores potential solutions for siting temporary living units within cities, and suggests a new system of short-term habitation that accommodates the needs of mobile citizens, such as mobile students. The proposed system follows the concepts and ideas of post-Fordism (Post-Fordism term in this text refers to the decentralization and “decentred society” and as characterized by Albertsen (1988).) architectural history in urban dynamics and housing strategies, and adopts the process of “Uberization” as an interactive, decentralized system of accommodation provision. Semi-autonomous habitation units are proposed as part of an interactive architectural system, which situates those units in response to individuals’ personal data. The aim of this research was twofold: (a) elaborating on personal data considering its limitations, concerns, and potentialities within creative architectural practice, and (b) addressing data-driven interventions within the urban environment. The ‘personal data’ used in this research was obtained from two sources, Instagram and Airbnb (The access to the data was limited to information on the number of active posts in each location and the location ID (latitude and longitude). The data protection and ethical standards were followed according to the data protection regulation on both sources.). Information processed from both sources was limited to an aggregation of geo-tagged online activities, (Instagram: number of hashtags and Airbnb: number of listings.) which was mapped and illustrated as ‘locative data intensities’. The research contributes by discussing these key questions: (1) How can real-world concerns such as mobility and migration be addressed through a narration of data analytics in smart city planning? ; (2) What is the position of personal data in speculative urban informatics and the built environment? ; (3) What are the limitations and potentialities of personal data in smart cities’ approaches towards a sustainable urban environment?